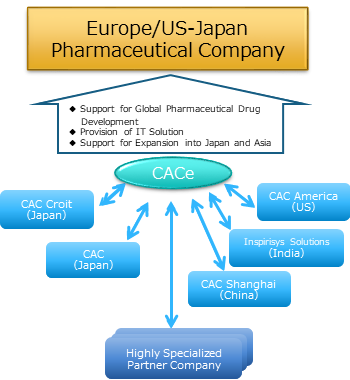 Based on close linkages with the group company based around CAC Croit Corporation and CAC Corporation, as well as partner companies with highly specialized expertise, CACe provides unique services in Europe and the US. We provide our clients with new forms of added value through the fusion of IT technology with business services for pharmaceutical drug development. In cooperation with CAC Croit Corporation, which possesses business support experience in the Japanese business environment with different regulations and business practices to Europe and the US, we support the smooth management of global operations. We provide services centered on the Japanese industry Number One “Support for Pharmacovigilance” and “Support for Regulatory Operations”. For clients considering expanding into Japan and Asia from Europe and the US or strengthening their operations after market entry we provide a one-stop shop through the combination of the services of CAC Corporation and CAC Croit Corporation, which have broad experience from IT through to business operations, and the services of the Chinese group companys CAC Shanghai Corporation and GoldenTech Computer Technology (Suzhou) Co.,Ltd..
At CACe, we stand beside our customers in coordinating their activities.